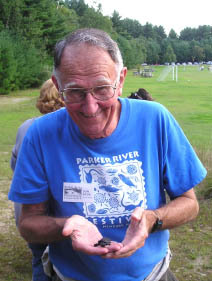 Don Bade with turtle. A wetlands advocate, he recently received the Art Longard volunteer award. Like many people, Don Bade didnt discover his passion for environmental conservation until a problem arrived in his own backyard. In the early 1990s, a 66-unit housing development was proposed on wetlands abutting the Parker River near his home north of Boston. The Parker River stretches through 19 miles of quaint New England towns from its headwaters in Boxford to its outlet at Plum Island Sound in Newbury. The watershed covers about 82 square miles [212 square kilometers]. Bade and his neighbors began attending town hearings. Their concern about protecting what they realized was a treasure in their area helped lead to the developments paring back to 48 houses. After that, we decided to keep protecting the river and its surroundings, says Bade, the volunteer president and co-founder of the group that became the Parker River Clean Water Association (PRCWA). We started to see developments coming into towns around here and we worried about all the land being eaten up and about what would happen to the environment. Today land use is almost a bigger issue than water quality and habitat protection. He said he realizes the pressures officials in small towns face from developers, but groups like PRCWA need to pressure them to uphold regulations to protect the area from runoff and other nonpoint source pollution. When the association formed with 20 members in 1994, the recently retired Bade was its treasurer, a natural extension of the 41 years he had spent in financial management. In 1996 the group received a two-year, $50,000-grant from the Massachusetts Executive Office of Environmental Affairs, and hired an executive director and part-time project coordinator. But in December 2000, grant money was running out, and there was no money to keep the paid employees. Bade stepped in and volunteered to run the association for free. Today, PRCWA has 200 members. For his many accomplishments in this role, he recently received the Gulf of Maine Councils Art Longard Award. Named for the late Nova Scotia conservationist and founding member of the council, the award recognizes a strong commitment to volunteer activities dedicated to environmental protection and sustainability of the Gulf of Maine. Bades easy smile and relaxed manner appear to belie his passion for the watersheds surrounding the Parker River and Plum Island Sound. He has strengthened all aspects of the organization through his inspiration and leadership, work with local officials, community outreach and local school projects. He partners with organizations that have broader environmental goals that benefit the whole region. I like building relationships with people, he says. For example, he is collaborating with the Great Marsh Coalition, which is working to protect and restore the more than 20,000-acre salt marshthe largest in New England that runs from Gloucester to Salisbury Beach at the Massachusetts/New Hampshire border. He also is a member of a strategic land-use committee that has studied the Little River, which flows out of Newburyport and is a major tributary to the Parker River, in an effort to protect about 1,500 acres of wetlands and open space as a green corridor. Spring means crocuses, songbirds and sunshine to many people. To the PRCWA it also heralds the annual alewife fish count, which runs for a month in April and May. Its another activity that brightens Bades eyes. Every spring the alewife return from the ocean to spawn upstream. The PRCWA musters a group of about 50 volunteers to stand by the top of the fish ladders near dams that the alewives must ascend. Ten-minute counts are held every hour. Pollution and obstacles to migrating such as dams and ladders that are in disrepair have played a role in the alewife populations drop to about 8,000 today from 30,000 about 30 years ago. Both the alewife count and the turtle research project have drawn a lot of human interest: residents and school children come out to count fish or to watch the turtles. They carry hatchling turtles to the river in the fall. Fences have been built around nesting areas to protect the eggs from foxes. But as a broader impact, interest in these activities has built a constituency over a local issue. You have to latch onto some local issues and how you can apply that to watershed protection to have an effective grassroots effort, Bade says. With limited funding, watershed groups havent disbanded, but there is less lobbying, and the groups have to be more proactive in fostering community involvement. And thats something Bade enjoys, and at which he excels.